There are a few methods to apply the formula for the rest of the cells in a column that the formula should be placed, or even to the last cell in the column. If you have a formula entered inside a cell and you want to apply it to the rest of the cells, the simplest method to do it is by clicking the little square in the bottom right corner and filling rest of the cells. This method is good because you have control over the number of cells you want to fill. You can go to the last row or just fill a number of them. The second method is faster, but you don’t have as much control as with the former method. This method is called AutoFill. In order to use it, hover the little square in the bottom right corner and double-click. 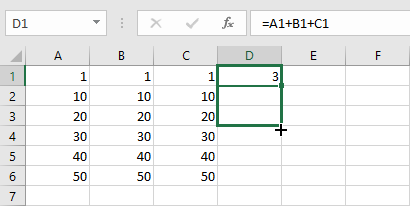 The next way to fill the rest of the cells is by using fill down. Select the cells D1:D6 or click cell D1 and press Ctrl + Shift + Down. The second method is especially useful if you have more cells and selecting them by dragging would be too time-consuming. Now, when you have the cells selected, you can go to HOME >> Editing >> Fill >> Down to fill the rest of the cells. Alternatively, you can use the Ctrl + D keyboard shortcut. It will also fill the cells with the formula. In order to apply the formula to the entire column, first, you should select it. In our example, you can use ctrl + space because our formula is in the top row. If it’s not in the top row it won’t work. The better way to do this is by clicking the cell with the formula and using the Ctrl + Shift + Down or clicking the icon HOME >> Editing >> Fill >> Down. 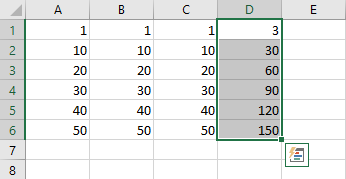 Because the formula is applied to all cells (million+) in the column, so it may take some time.